large crack down the center of the highway. Artist Point is a very well-known destination along State Route 542/Mount Baker Highway, but the highway offers access to numerous other trailheads and campgrounds. It's a popular destination, and so our decision to close it from 8:30 a.m. to 4 p.m. for much of this week was one we didn't take lightly. Still, I'm sure many folks are wondering. Who's the genius that decided to completely close the road for a few days in late summer?! There's never a perfect time to shut down a highway. Most of our paving can only happen during the summer when it's dry and warm enough. For SR 542, the work simply couldn't wait, as it's been 12 years since this area has been repaved. We prioritize potholes that are about an inch or two deep and about a foot in diameter. 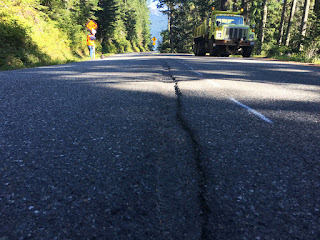 The centerline in this stretch near the Silver Fire Campground at Anderson Creek Road has a crack about an inch deep, two inches wide and can be 1,500 feet long in some areas. It resembles more of a fault line than a pothole. If it isn't fixed now, it's likely we'd have to come back at some point during the next year to make emergency repairs, which are unpredictable, are much more costly, and could cause a longer closure. This stretch of roadway hasn’t been repaved in 12 years and the crack would've grown without being repaired. So I get the whole safety thing, but why close the entire highway? We try to keep at least one lane open during closures, but in this case it wasn't possible. Working in the center of a 22-foot-wide road (a few feet less in some spots) with no shoulders or guardrail means there's no room to do single-lane closures. The work area is almost 9-feet wide, leaving about 5 feet on either side. That's no enough room to safely squeeze vehicles past the work. From sun up to nearly sun down, crews have been grinding out the existing asphalt in the center of the road, sweeping up the leftover bits that aren't funneled directly into the truck from the grinder, and laying down new asphalt before smoothing it out. We managed to even out 3,000 feet of the centerline on Monday and another 3,200 feet on Tuesday, using about 200 tons of asphalt a day. There's been 20 truck loads hauling away the ground asphalt, with each truck holding about 12 yards of asphalt. If the weather continues to cooperate, the work should be done by Thursday afternoon. We want to extend a huge thank you for your patience and understanding. We know this is an inconvenience to many, some of whom had made plans. Thank you for bearing with us and adjusting your schedule to help us get this very important work done. Summer is coming to an end and many people will be trying to enjoy a last-gasp of warm weather, making Labor Day one of the heaviest traveled weekends of the year. If you are headed east to see Dave Mathews at The Gorge or simply enjoying the solace of eastern Washington, don't get stuck 'treading trodden I-90 for a long long time.' We've got a few tips to consider before hitting the road. Where are the slow spots? Traffic is down to one lane eastbound at the Vantage bridge for a painting project. While work won’t be happening, the concrete barriers have to stay in place in case of high-wind emergencies in which the containment system must be taken down ASAP to prevent bridge damage. We recommend crossing the bridge before 11 a.m. on Friday or consider taking alternate routes such as US 97, Interstate 82 or State Route 24. 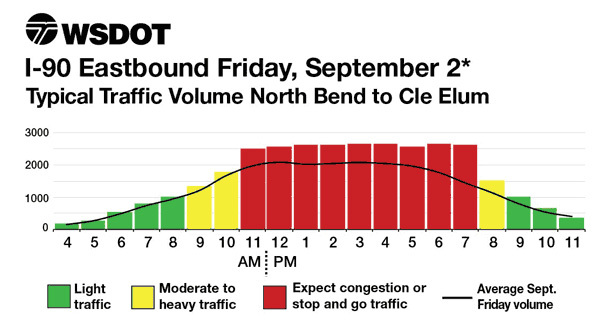 Eastbound traffic on Snoqualmie Pass gets backed-up Friday afternoon and Saturday mornings near Easton and Cle Elum. Although we won’t be working, there are multiple inactive work zones with narrow lanes and shoulders that will cause a couple pinch points. We also recommend leaving early Friday or waiting until later Saturday afternoon. US 2 is a viable detour, but it gets busy on the weekends as well. The rush to get back home westbound Sunday and Monday always cause delays too. Mornings are your best bet to beat the backup. There is no point in speeding up and making up for lost time. That can be dangerous and deadly. Please obey all posted speed limits. We want you (and others around you) to arrive safely. The Washington State Patrol will increase patrols and issue tickets to reckless drivers. Before heading out, check our mobile app and our Snoqualmie Pass web page. These travel graphs will give you an idea of the best times to travel. No doubt about it, there will be heavy traffic this weekend. But with a little patience and perhaps humming along to Dave Matthews Band, you'll get there. Until then, safe travels. When we wrapped up the last of our #SouthKingSlowdown weekend-long lane reductions Monday morning, Aug. 22, we all let out a collective breath. 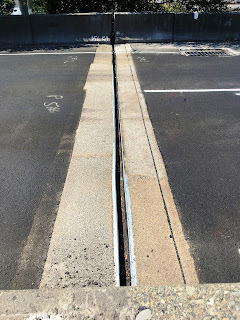 Over five weekends in the past two months, our contractor crews from MidMountain Contractors Inc. repaved 2.7 miles of southbound I-5 in SeaTac and Des Moines and replaced four expansion joints on the Duwamish River Bridge. It was hard work, and we also know it was tough maneuvering around the closures. We want to thank drivers for their patience and cooperation, as many chose alternatives, which helped limit backups to 3 or 4 miles at various times. Without that help, backups could have been longer and more cumbersome. We know that anytime we reduce the number of lanes on a highway, it’s going to be inconvenient. We work with our Construction Traffic Control Office and our contractor to plan around events like Seafair and the Independence Day holiday weekend, but it’s impossible to avoid all events, especially over the summer when a lot of this work has to happen. We bumped up against a couple of concerts, some Sounders and Mariners home games and the Bite of Seattle, but we do the best we can. The weekend-long lane reductions are finished, but remember, our contractor will still have nighttime lane reductions the rest of this year and into early 2017. We still need to finish grinding ruts, paving and repairing expansion joints, so stay engaged on our website, mobile app and Twitter. Almost three miles of southbound I-5 has been paved so far in South King County. This project is rehabilitating about 13 miles of southbound I-5. After serving our region for 50 years, the interstate has earned it. This work will keep our region’s key arterial functioning for decades to come. While we complete work on southbound I-5, we’re designing a similar project for northbound I-5 between South 260th Street in Kent and the Duwamish River Bridge that will start in spring 2017. While shorter in distance, this work will present more challenges. 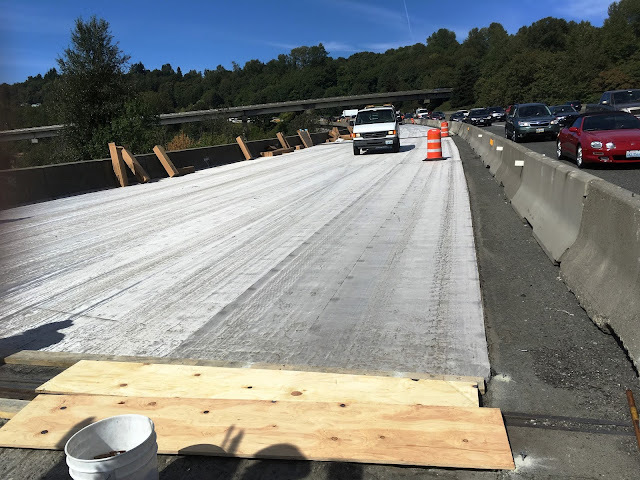 In addition to replacing broken concrete panels and grinding ruts off of the interstate’s surface, we’ll replace eight expansion joints on a couple of bridges and repave four miles of northbound I-5 using the crack, seat and overlay process. We’re still developing the northbound project, but we know there will be more weekend-long lane reductions, as well as many overnight lane reductions. We recognize the challenges these pose. For example, the northbound morning commute from south King County is much heavier than the southbound. That means it will be even more important to be sure all lanes are open on time. When we have weekend-long lane reductions for this project, people will still want to get to Seattle on time for sporting events, concerts and other attractions. Just like we did this summer, we’ll provide information about alternate routes and transportation alternatives so you can plan ahead and be on time for the opening chords, the first pitch or your reservation. Working together, we’ll rehab I-5 while you enjoy your summer. It just takes some planning, and we’re already working on that. We’ll keep you informed about this and all of our projects. The eastbound US 2 trestle is ready for back-to-school season. After feedback from commuters earlier this summer, we’ve extended peak shoulder use along the eastbound trestle that runs between Everett and Lake Stevens/Snohomish. Commuters can now use that additional shoulder lane starting at 2 p.m. instead of the previous 3 p.m. Peak shoulder use in that stretch lasts until 7 p.m. 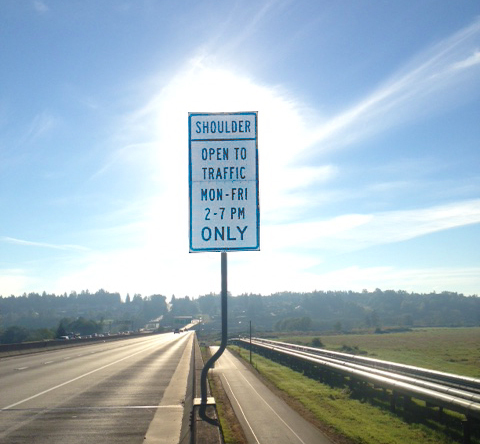 The shoulder along the US 2 trestle will be open to traffic one extra hour during peak travel times. This request wasn’t granted overnight. 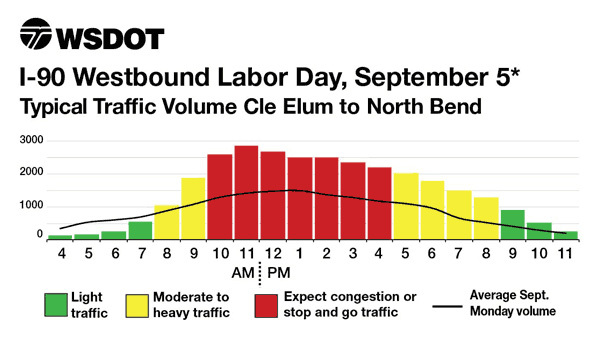 Our engineers did a traffic study to make sure the volumes between 2 p.m. and 3 p.m. warranted this change. We also checked with our maintenance teams and Washington State Patrol to ensure proper emergency response would be available during that hour. So, for those of you who drive US 2 eastbound from Interstate 5 – let us know how the change is working. 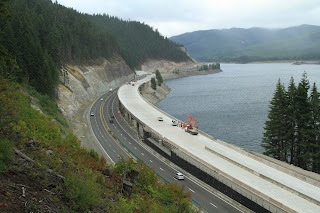 Why doesn’t WSDOT allow shoulder driving in more areas? Opening a shoulder to traffic means less time for crews to use the shoulder for maintenance and emergencies. 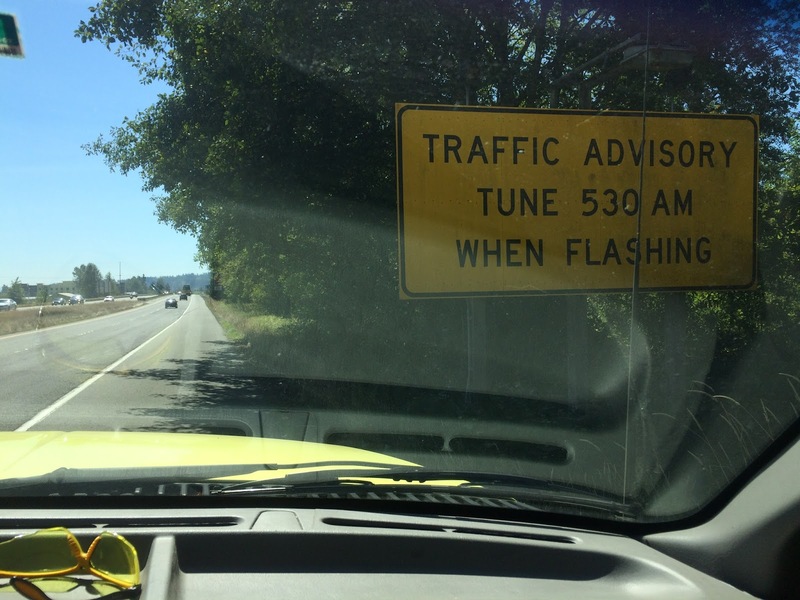 For example, on SR 522 west of SR 524 this sign has flashing beacons to warn drivers about the upcoming stoplight. Right now, if our signals team needs to replace one of the lights or make another quick repair, they can drop a “Shoulder Work Ahead” sign, have a safety-vehicle in place and pull up a large bucket truck to the sign, fixing the issue in no time. If this shoulder was being used by traffic, they’d need to close a lane to safely fix it. Shoulder accessibility is important for maintenance and emergencies. And all those great times when our Incident Response Team quickly gets a stall pushed to the shoulder? That wouldn’t be as easy if there wasn’t a shoulder to clear to. There are also plenty of engineering considerations when it comes to peak shoulder use. We wouldn’t consider implementing it in stretches where highway segments lack the capacity to safely accommodate the increase farther down the road. Our engineers make sure there is a logical, sound and strong engineering basis for choosing which stretches peak shoulder use is appropriate for. Where else is peak shoulder use allowed? As you might’ve read earlier this month, peak shoulder use will begin on northbound I-405 between SR 527 and I-5/Alderwood next summer. There are also future plans for peak shoulder use on I-90 between Bellevue and Issaquah and I-5 between Everett and Marysville. Until those kick in, those of you in Snohomish County, enjoy your extra hour of peak shoulder use on eastbound US 2 this back-to-school season. We appreciate your comments, feedback and suggestions on ways to keep all Washingtonians moving safely and efficiently. Anyone who travels on southbound I-5 through Tacoma knows how congested the freeway can get with four lanes available to drivers. Imagine what would happen if there were only two lanes. This weekend, you won’t have to imagine, and we know, it’s going to be rough. Drivers should expect extra congestion on I-5 in Tacoma this weekend due to extensive paving work. What’s going to be closed? Let’s start with I-5. Southbound I-5 in Tacoma near Portland Avenue will be reduced to two lanes around the clock from 10 p.m. Friday, Aug. 26 through 5 a.m. Monday, Aug. 29. About 100,000 drivers use this portion of southbound I-5 every day and a large percentage of those vehicles will need to find other ways to travel around the area in order to avoid major backups and delays. 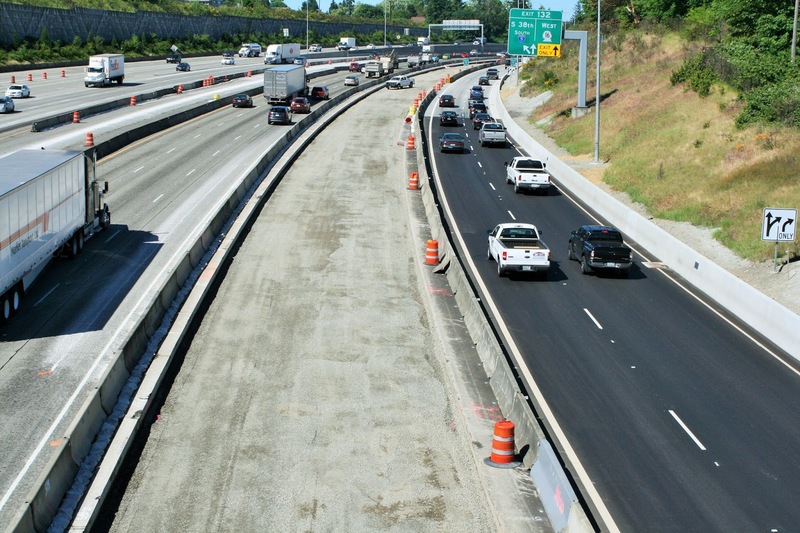 The weekend-long lane closure will allow the contractor working on the I-5 M Street to Portland Avenue HOV project to replace nearly 1,200 feet of aging concrete on southbound I-5. But that’s not all. During the same weekend, State Route 16 will be reduced to two lanes in each direction at the Tacoma Narrows Bridge for paving. Lane reductions on eastbound SR 16 will occur in phases starting at 6 p.m. Friday, Aug. 26. The two westbound SR 16 lanes will be detoured onto the eastbound bridge. That shift will also occur in phases starting at 8 p.m. Friday. The speed limit will be temporarily reduced at the bridge from 60 mph to 35 mph. The Tacoma Narrows Bridge will be reduced to two lanes in each direction this weekend for paving. 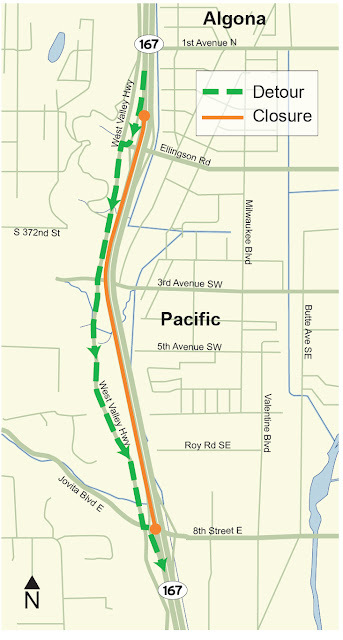 The 24th Street on-ramp to eastbound SR 16 and the westbound SR 16 exit to 24th Street will also be closed, and the Jackson Street on-ramp to westbound SR 16 may also need to be closed. The ramps will be closed at 7 p.m. Friday. All lanes and ramps will reopen by 5 a.m. Monday. The same closures on SR 16 will occur again over the weekend of Sept. 9-12 with similar hours. 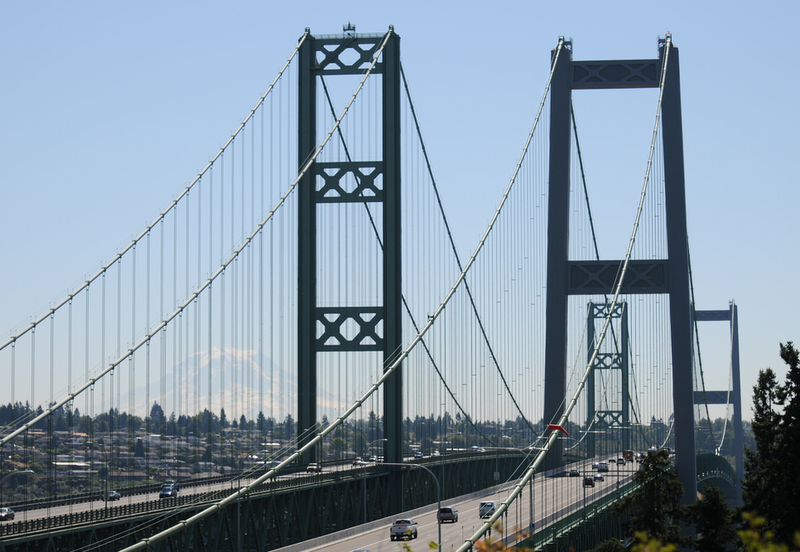 In order to repave the eastbound SR 16 Tacoma Narrows Bridge, crews will reduce the number of eastbound lanes available to traffic during overnight hours between 7 p.m. and 5 a.m. starting Monday, Aug. 29 through Thursday, Sept. 1. The westbound bridge will be open to westbound traffic during that time. Why schedule these closures the same weekend as the JBLM Airshow, the LeMay Car Show and the Tacoma half-marathon? There’s never a good time for major closures like this, and planning them is a big challenge. We make every effort to avoid as many huge travel weekends as we can, including holidays, and try to avoid big events whenever possible. But we have to balance that with needs of a particular job – dry weather, for example – as well as working around other projects. Every construction contract has different obligations attached to them. 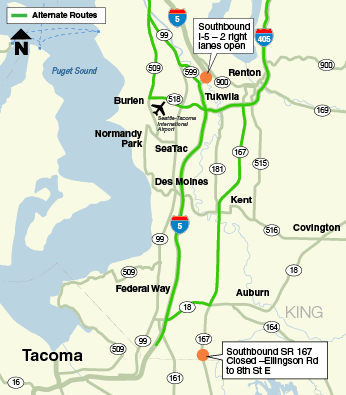 We would have preferred the work on I-5 to occur the weekend of Aug. 19-22 but I-5 through Tacoma was the detour for the full closure of State Route 167 near Pacific that weekend. We also need dry weather to pave and stripe. As we start to push into September, our dry weather days quickly evaporate. This wasn’t our first choice, but it’s the hand we were dealt. That’s why we are advising drivers to add as much extra time as possible to your trips, go early, and consider eliminating discretionary travel. We love our regional events just as much as you. Go enjoy the air show, fly a kite at Chambers, or cheer on the Sounders in Portland. Be sure to plan extra time into your trip and take an alternative route if you know it. If you haven’t tried carpooling, taking the Sounder Train yet, or riding the bus, now might be a great time. Pierce Transit is providing bus transportation to the JBLM Airshow from Lakewood Towne Center, the Lakewood Sounder Station or the Tacoma Dome Transit Station. Visit http://www.piercetransit.org/jblm-air-show-express/ for details. Allow extra time to reach their destination. Consider delaying or rescheduling discretionary trips. Travel early in the morning before 9 a.m. or later in the evening after 9 p.m. Choose an alternative travel mode, such as public transportation (transit, ferry, light rail or commuter rail), bicycling or carpooling. 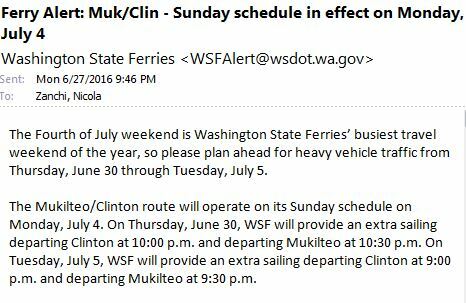 County work, but be sure to plan ahead if you want to sail. If detouring: take early sailings, before 10 a.m. or late sailings after 7 p.m.
Ferries expects wait times of up to three hours during the day and into the early evening on summer weekends, especially for the next two weekends as folks squeeze the last drops out of their summer vacations. Don’t miss the boat! Plan to arrive at the dock 30-45 minutes before the scheduled sailing because it could take time for people in line to process through the tollbooth. If taking a midday or afternoon ferry, expect wait times of 1-3 hours. South end ferry routes to use as a detour: Seattle to Bremerton, Fauntleroy to Vashon then Tahlequah to Point Defiance; Fauntleroy to Southworth. 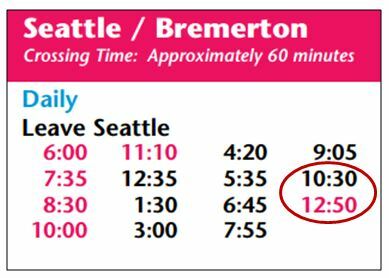 Please note that the Point Defiance/Tahlequah route saw long wait times during the pervious air show and we expect similar wait times this year. There is no wait for walk-ons! If it works for you, consider walking on the ferry or riding a bicycle and connecting with transit or a ride from a friend on the other side. Will tolls be collected on the Tacoma Narrows Bridge during construction closures? Tolls will still be collected for drivers traveling eastbound on SR 16 as normal. Drivers travelling westbound will not be charged tolls. We must ensure that Tacoma Narrows Bridge tolls are generating enough revenue to cover our debt payments. This is achieved by applying tolls fairly and consistently. We do not waive or refund tolls due to collisions, special events, or construction. Similar to a homeowner who needs to make mortgage payments every month no matter what, we must make debt payments to bondholders to pay for the new Tacoma Narrows Bridge. Waiting in the airport security line, getting cavities filled, and taking detours around closed highways—all are necessary activities that I’m sure you would prefer to avoid repeating for 30 days in a row. Well, we can’t help you with the airport or the dentist, but we can help with the detour. Our contractor crews working in Algona/Pacific on our SR 167 HOT lane project will save drivers 30 nights of lane closures by condensing their fish passage and paving work into one weekend. Nice! During the weekend of Aug. 19-22, crews will close a portion of southbound SR 167 around the clock to repave nearly a mile of the highway and complete construction of a new 368-foot-long fish passable culvert. To minimize impacts to drivers, crews have been building the culvert in stages, moving from east to west. Construction of the eastern half of the culvert began in June, and crews moved traffic around the construction site to avoid inconvenient highway closures. But now, we need to close the road for one last push to complete the culvert. for a culvert replacement and paving job. The culvert improvements are designed to help fish migration in Jovita Creek. The culvert’s water flow is too low and too fast for fish to swim in, and the culvert’s opening is too high for fish to jump into as they progress upstream. The improvements will help the Chinook salmon, coho salmon, and steelhead trout that use this creek to reach their needed habitat. During the job, workers will excavate enough dirt to fill more than 100 backyard swimming pools and will restore 920 cubic yards of streambed, the equivalent of almost 74,000 party-sized tubs of ice cream. Closing southbound SR 167 for the culvert work also presents an opportunity to pave one mile of southbound SR 167, ensuring that crews are getting the most out of the highway closure. Crews will use nearly 10,000 tons of asphalt to pave the road, which is about the weight of the Space Needle. Meanwhile, 18 miles north of our SR 167 closure, it’s the last weekend of work on the I-5 #SouthKingSlowdown. Southbound I-5 lane reductions from South Boeing Access Road to Interurban Avenue South will begin at 8 p.m. Friday, Aug. 19. By 10 p.m. Friday, traffic will be reduced to two lanes through 5 a.m. Monday, Aug. 22. The off-ramp from southbound I-5 to SR 518 will remain open for drivers traveling to Sea-Tac International Airport and other destinations but if you’re headed to the airport, allow lots of extra time and consider alternate routes like SR 99 or SR 509. 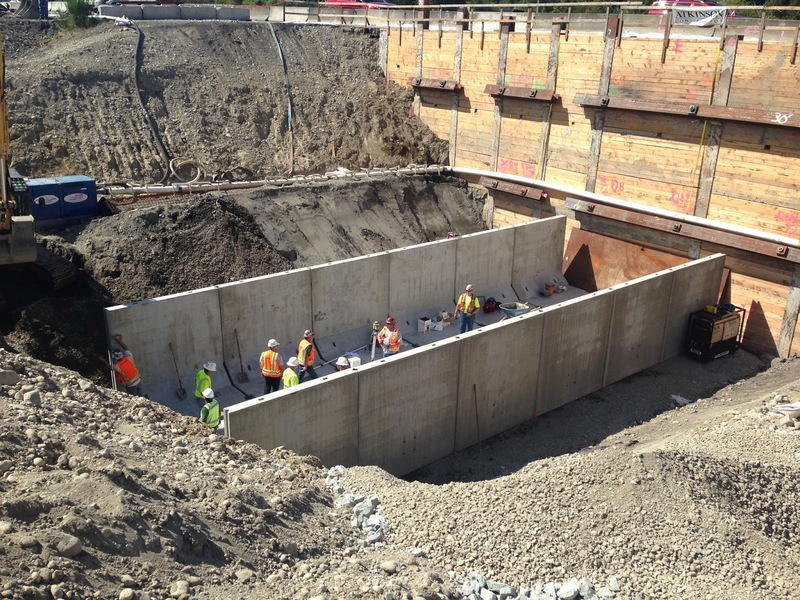 Crews will finish installing this new fish culvert in Jovita Creek during this weekend’s SR 167 southbound closure. While it’s great that we’re reducing the SR 167 closure to one weekend, that still could make this weekend challenging. It’s a good idea to leave early and plan ahead, especially if you’re headed to a special event. You can plan ahead by checking the Seattle and Tacoma traffic pages for updated traffic conditions, and also download WSDOT’s mobile app. If you must drive through the work areas, follow the signed detour routes (pdf 378 kb). Remember to allow extra time to travel through the work zones or on alternate routes. To help you plan ahead, you can get the most up-to-date details and a full listing of closures by visiting the King County Construction page. You can also follow the hashtag #SouthKingSlowdown on Twitter for updates. What’s ahead on SR 167? 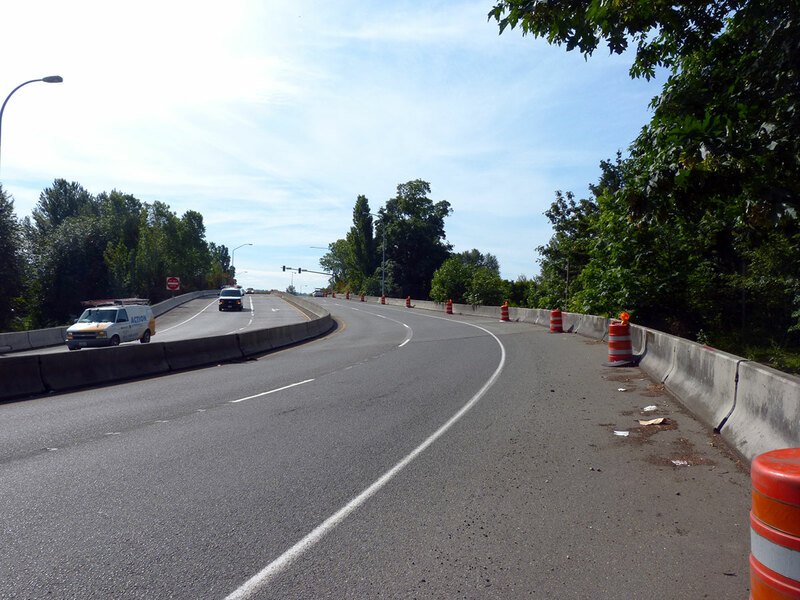 Crews are on schedule to complete the remaining widening of southbound SR 167 between 37th Street Northwest in Auburn to 8th Street East in Pacific by fall 2016. At that time, the new lane will open to traffic as an HOV lane. Contractor crews plan to install toll equipment by early 2017. When the project is complete, the lane will operate as a HOT lane. Can the flutter of a butterfly's wings really cause a tornado halfway around the world? Whether or not you believe in the butterfly effect, it's not something we want to risk when turning on a new ramp meter. in conjunction with the new ramp meters to I-405. And that's why it has taken us several months to flip the switch on two southbound I-405 ramp meters in Bellevue and Tukwila. 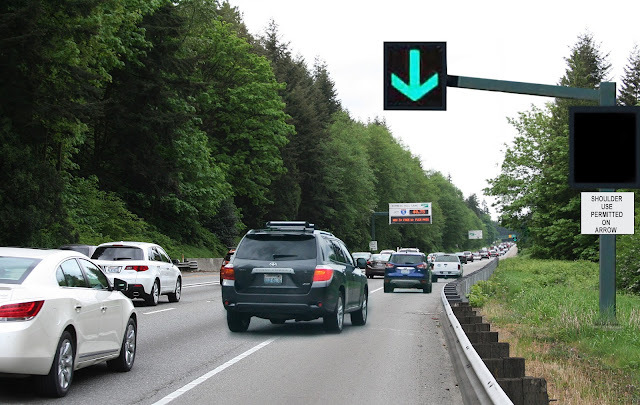 After a combination of funding delays, extensive data collection and signal modifications on surface streets, we've got the green light for ramp meters at Interurban Avenue South/SR 181 and at Coal Creek Parkway to be turned on in mid-August. Ramp meters are used across the country to create an even pace for vehicles entering the highway to improve safety and traffic flow along busy corridors – in this case, southbound I-405. But installing a ramp meter without careful and thoughtful research, consideration and collaboration with local governments could create a negative butterfly effect in the way of increased congestion on other roadways. We turned off the original ramp meter on the Interurban Avenue South/SR 181 on-ramp to southbound I-405 for a City of Tukwila construction project in 2011, when there was an HOV bypass lane on the ramp and a metered general purpose lane. to assist traffic flow near the I-405 ramp. At the time, we'd received several comments about the HOV lane being underutilized and traffic in the general purpose lane backing up onto Interurban. The City of Tukwila was also preparing to close the intersection of Southcenter Parkway and Klickitat Drive, where many people leaving the mall access southbound I-5. 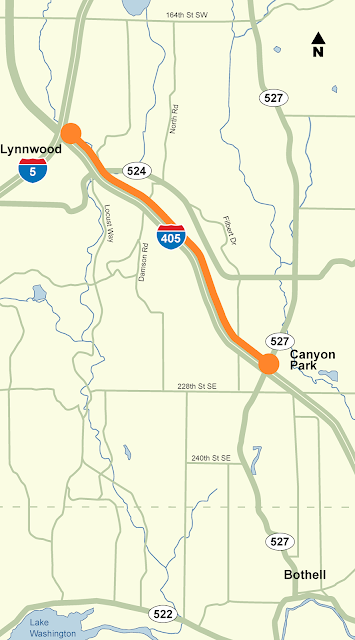 The planned detour route was the Interurban on-ramp to southbound I-405. A combination of the two lead us to a collaborative decision with the city to turn off the ramp meter and convert the HOV lane to a second general purpose lane for better utilization of the ramp. The plan at the time was to eventually put up a new ramp meter with two general purpose lanes once the Southcenter/Klickitat intersection reopened. But due to a lack of funding, we weren't able to install a new ramp meter until this past spring. We'll flip the switch on this ramp meter on Monday, Aug. 15. 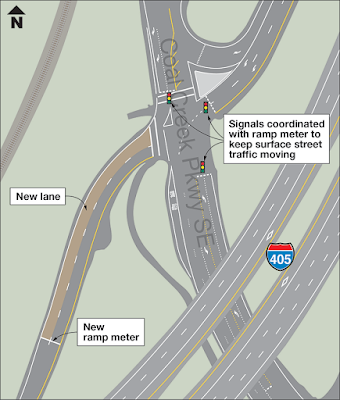 The Coal Creek Parkway ramp meter to southbound I-405 was installed in the spring and summer of 2015. Prior to that, King County Metro Transit moved a bus stop from the on-ramp to a nearby park-and-ride, leaving the existing bus pull-out available for general purpose traffic. We took the opportunity to use this space to create a second general purpose lane when we turn on the ramp meter on Wednesday, Aug. 17. 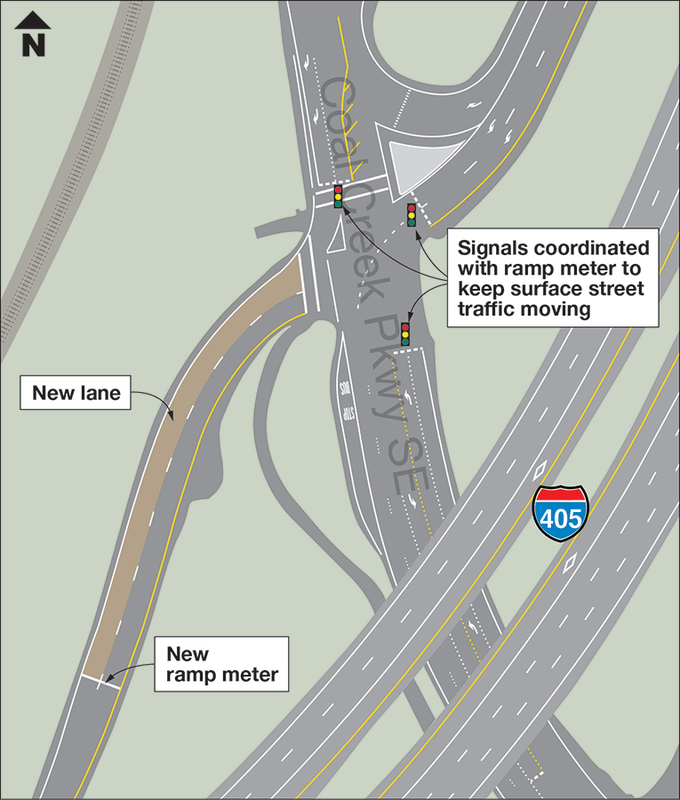 These new I-405 ramp meters will help maintain traffic flow on the interstate. That second lane will provide more space for vehicles entering southbound I-405 in an area that gets congested during peak commute times. But what if both lanes get backed up? That's what we've been working with the City of Bellevue on over the past year by collecting data at a couple of intersections just upstream of the ramp. The city has been using this research to sync signal timing along Coal Creek Parkway with the new ramp meter. These new ramp meters become active on Monday, Aug. 15. 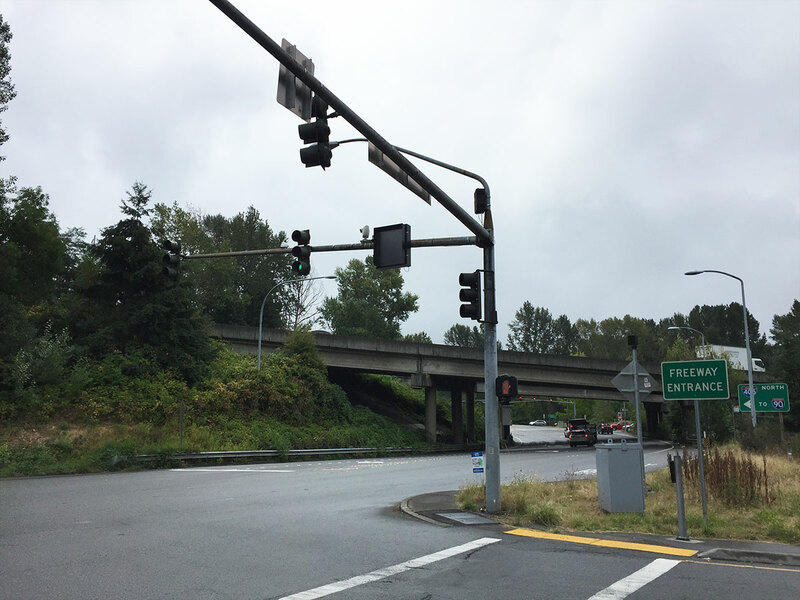 While it won't look much different, the city will make some noticeable changes at the southbound I-405 ramps/Coal Creek Parkway intersection. Traffic coming from downtown Bellevue on 118th Avenue Southeast making a right turn onto the ramp will now be signal controlled. A "No Right Turn on Red" sign will be lit up whenever the ramp is being metered and dark during all other times. Previously, the right-turn lane was free-flowing 24/7. 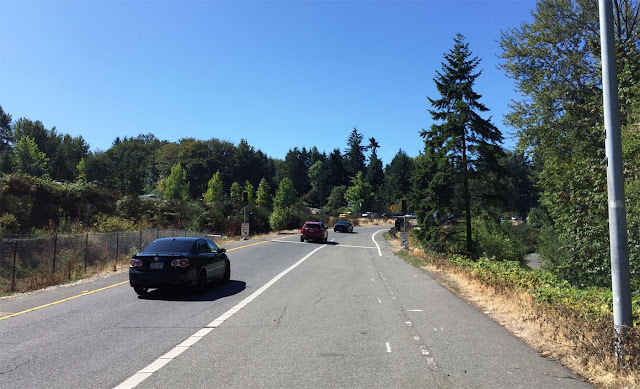 Also, traffic coming from Factoria on Coal Creek Parkway making a left turn onto the ramp will get signal priority at the intersection to utilize the extra space on the ramp and help avoid congestion on Coal Creek. For the first few weeks of operation, we'll be watching both ramp meters very carefully to see if modifications are needed. We expect drivers to take some time adjusting to the new traffic patterns as well. Both ramp meters will only activate when traffic on southbound I-405 dips below the posted speed limit. Signal timing is no simple task and it takes engineers much time and finesse making sure everything is just right. For many, understanding the science behind it may be just as hard as understanding the butterfly effect. In addition to ramp meters being activated in Bellevue and Tukwila, ramp meters are also being activated in Pierce County. Starting Tuesday, Aug. 16, newly installed ramp meters will be activated at the State Route 7 (Pacific Avenue) on-ramps to westbound State Route 512 and at the Steele Street on-ramp to westbound SR 512. These meters will also be carefully monitored to see if modifications to the meter rate are necessary. Ferry reservations and added sailings got you FERRY confused? We're here to help. We operate 22 ferries on 10 routes, and several of those routes require vehicle reservations. With more than 450 sailings per day, reading and understanding the schedule and making reservations can be difficult. Here's some tips for navigating two important ferry functions, reservations and added sailings, as we sail toward the end of summer and into fall. While fall may be just around the corner, the summer season is still in full swing, and some of the busiest travel weekends are coming up. Here's a refresher on how ferry reservations work. Ferry reservations are advised to guarantee a vehicle (including motorcycles) a spot on Port Townsend/Coupeville, Anacortes/San Juans, and Anacortes/Sidney B.C. routes. 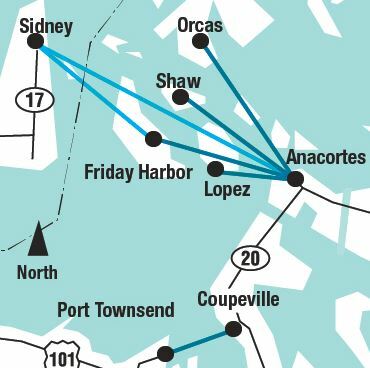 All other routes function on a first-come, first-served basis for vehicles spaces, including the San Juan Islands inter-island ferry route. Ferry reservations are released in a tiered system. On average there are between 20-40 reservable spots per vessel, per tier. At times, most notably in the San Juan Islands, vessels load reserved spaces for different stops on the same sailing, so the number of spots available is dependent on the number of stops the vessel is making. Vehicles may ride stand-by, but in the summer months at peak travel times (12:30 p.m. – 7:30 p.m. Thurs- Sunday), riding stand-by on reservable routes can be risky. Only 10 percent of every reservable sailing is held open for emergency and stand-by vehicles. Ferry reservations can be made online or over the phone. We recommend making reservations online, as to avoid phone wait times. Here are a few tips and tricks for the reservation "what-ifs?" No reservations available and riding stand-by? In addition to the 10 percent of stand-by space on each sailing, more stand-by space is always available on sailings when drivers don't use their reservations or if they travel at a different time. The best time to ride stand-by is before 10:30 a.m. While you may not always get on the sailing of your choice, traveling stand-by is an option when you need to travel at the last minute or can't make a reservation. Don't forget the 30-minute rule! Whether you have a reservation or not, if you're in a car or a motorcycle you must be through the tollbooth 30 minutes before the vessel departure time. This allows us time to load the vessels safely. If you are not through the tollbooth 30 minutes prior, your reservation will be forfeited and you will be directed to the stand-by lane. We hope to never cancel sailings, but in the event that it happens, you will be given the option to remain at the terminal and will have priority boarding for the next sailing. If the cancellation happens in advance, you will be contacted by an information agent to rebook your travel. If you can, ditch the car! Reservations are never required if you walk-on or bike-on the ferry. Many terminals offer parking areas, including Anacortes, your gateway to the San Juan Islands. 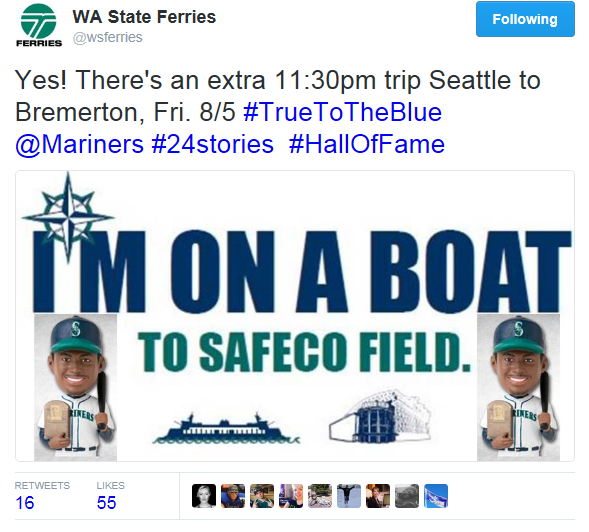 It has become popular for us to add an 11:30 p.m. sailing from Seattle to Bremerton for Mariners games because of the long gap between the daily 10:30 p.m. and 12:50 a.m. sailings. 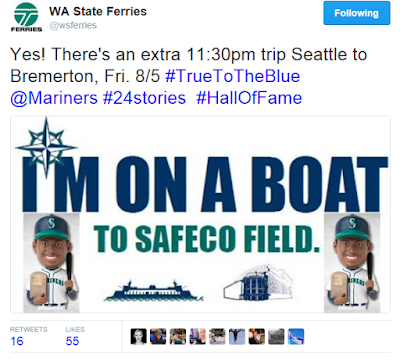 If most Friday and Saturday games start at 7:10 p.m. and last about three hours, fans are unable to reach the 10:30 p.m. sailing so we add extra sailings to accommodate the gap in the regularly scheduled sailings. Similar added sailing also occur for some concerts and other sporting events. us to sometimes add an extra sailing. We get creative to let people know about added sailings. Doe Bay Festival is a four-day grass roots music festival on Orcas Island in early August and brings thousands of visitors to the island. We mitigate that demand by adding sailings on Thursday, Friday, and Sunday of the festival weekend. This principle also applies to added sailings for our busy holidays such as Memorial Day, Thanksgiving, New Year's, and Fourth of July. We send out alerts to let people know about extra sailings for holidays. Keep an eye on Twitter for automatic updates on travel conditions. Forty years after the Jeffersons were moving on up, the #SouthKingSlowdown will follow suit as the major I-5 rehab project is moving north. The project is entering its fourth of five weekends of lane reductions and here’s what to expect as we head up the highway. 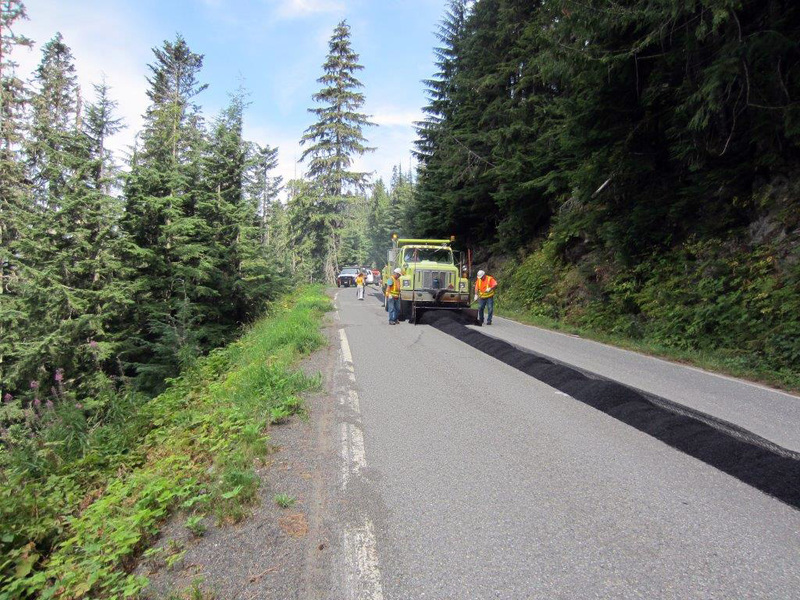 This weekend, Aug. 12-15, our work will begin at SR 900/Martin Luther King Junior Way South and end at Klickitat Drive, a bit further north than our previous few weekends. 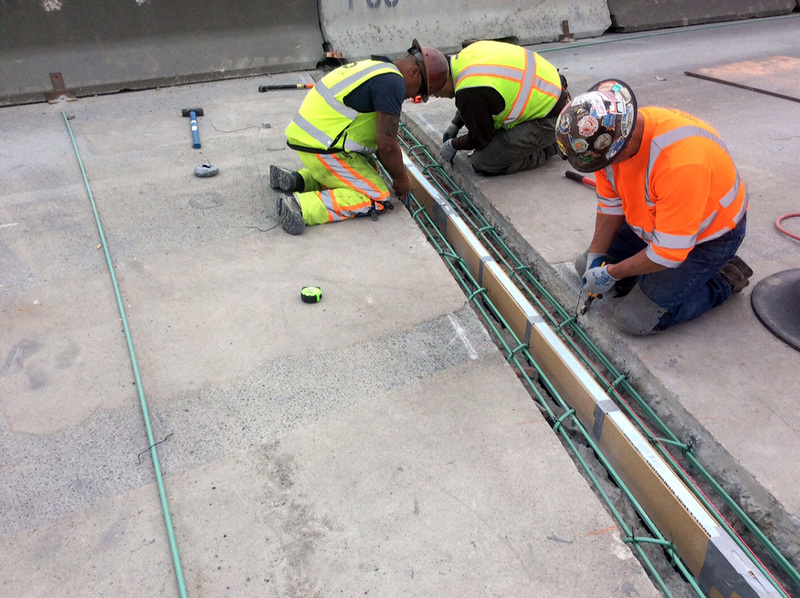 With the move north, our contractor crews can replace expansion joints on the right side of the southbound I-5 Duwamish River Bridge and complete drainage repairs under the right lanes near the southbound I-405 interchange. 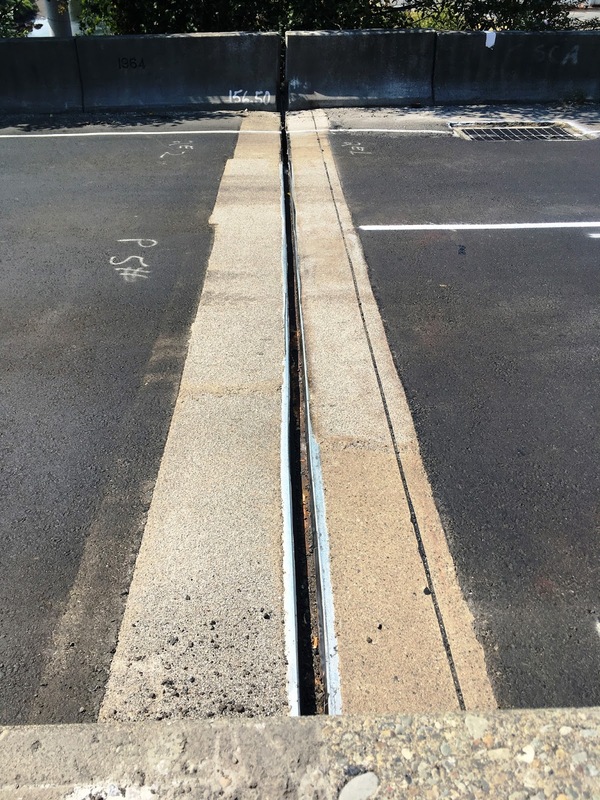 Crews place rebar to reinforce the concrete as they replace an expansion joint. The weekend-long lane reductions begin at 8 p.m. Friday, Aug. 12. By 10 p.m. Friday, traffic will be reduced to two lanes until 5 a.m. Monday, Aug. 15. The HOV lane will be open to all vehicles throughout the weekend work. The southbound SR 900/Martin Luther King Junior Way on-ramp to southbound I-5. The southbound I-5 off-ramp to Interurban Avenue. The southbound SR 599 right side ramp to southbound I-5. The southbound I-405 ramp to southbound I-5. Farther south, contractor crews have been constructing a 368-foot-long fish passable culvert under SR 167 in Algona/Pacific since early July. Crews have innovatively worked construction around traffic to save drivers from weeks of nighttime closures. But now, crews need to begin closing lanes and ramps over the next two weekends to complete the work. green lines show alternate routes. This weekend, we’ll close the 8th Street East on-ramp to northbound SR 167 from 11 p.m. Friday Aug. 12, to 5 a.m. Monday, Aug. 15. To help drivers out, a signed detour will be in place. While this weekend’s ramp closure is just a small taste of what’s ahead, the closure provides an opportunity to practice staying alert and using alternate routes in the area. The good news is the SR 167 closures and the I-5 lane reductions are 18 miles apart, with several alternate routes for drivers to navigate around them. The culvert improvements are part of the SR 167 Southbound HOT Lane Extension project, and will help fish migration along Jovita Creek. If you’re interested in strategizing your weekend trips and discovering how to nimbly navigate highway closures, then we’ve saved the best for last. 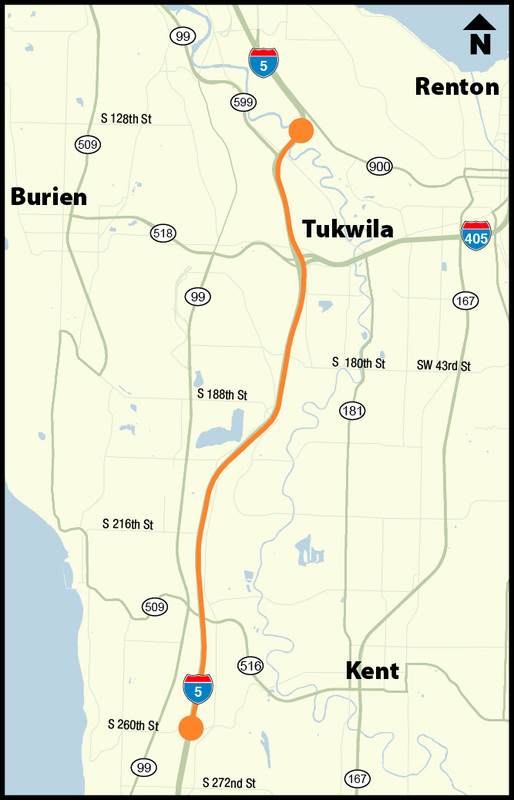 The last weekend of the #SouthKingSlowdown, Aug. 19-22, the I-5 lane reductions continue in Tukwila. Also, 18 miles to the south, all lanes of southbound SR 167 will be closed in Algona and Pacific. If you’d rather avoid it all, you may keep your weekend activities local. However, if you must drive through South King County the weekend of Aug. 19-20, we’ve created a map of alternate routes to help you plan your trip ahead of time. So far, drivers have been doing great job staying alert and taking alternate routes. We need you to continue keep up your guard and practice planning and patience for the next two weeks. At the end of the #SouthKingSlowdown, I-5 and SR 167 drivers alike will enjoy a smoother, more comfortable stretch of road—and to top it off, the fish of Jovita Creek will benefit from better access to the habitat they need. We're smack dab in the middle of a couple of chip sealing projects in Skagit, Whatcom, Snohomish and Island counties, and we want to thank drivers for your ongoing patience. We know it has been tested. 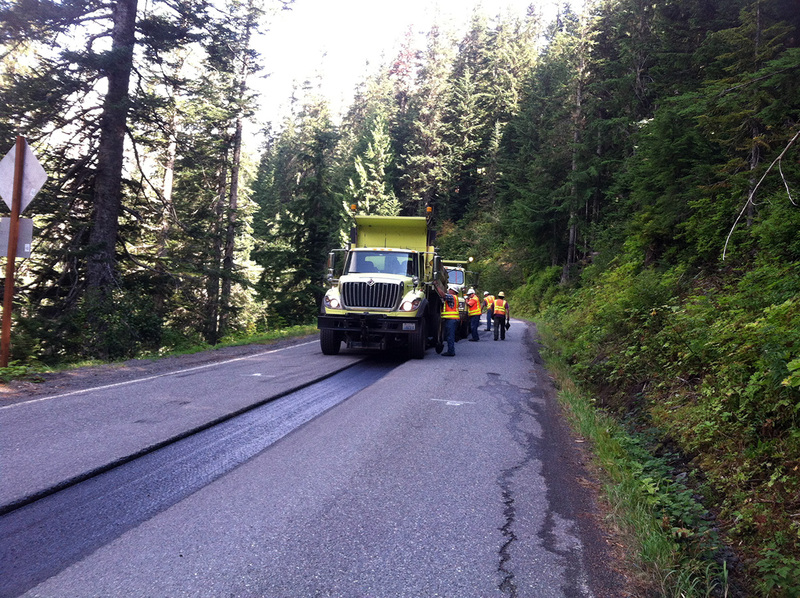 This is the first summer we have used chip sealing in this part of the state in a long while as the state looks to stretch limited resources while maintaining roads. A lot of the highways (State Routes 9, 20, 530, 542, 547 and 548) that contractor crews are working on haven't been repaved in more than 20 years. Chip sealing is a cost effective way to get rid of those cracks and potholes to keep the road safe for drivers. The price tag is about a third of what it would take to repave. This work does take time, though, and can only be done during the day in the summer months when it's warm enough for the seal to cure. Unfortunately, traffic backups come with the timing of this intensive work on some sections of the highway. We base the timing of the work at each location around non-peak travel times after looking at the traffic volumes, but some congestion is unavoidable. Chip sealing repairs roads at a fraction of the cost of asphalt repairs, allowing us to stretch our maintenance dollars further. Among the hot spots we've seen are SR 20 on Whidbey Island in the Morris Road area, and on SR 9 near SR 530 in Arlington. During heaviest times, we've seen it take from 30 minutes to an hour to get through some of these areas. Once a lane of traffic is closed, crews spray an oily water mix on the highway before immediately applying a layer of crushed gravel (known as "chips"). A roller then drives over the gravel to compact it. Drivers play an important part in the next step. The lane opens up for one to two days so traffic can go over the new surface to finish off the compaction process. Speeds are reduced to 35 mph during this time to protect the newly repaired road, keep rock chips from cracking windows, and to limit the amount of dust that gets kicked up that could limit visibility. A sweeper is then used to get rid of any loose gravel before the road is restriped. The final step is to apply a fog seal. This is a spray of liquid asphalt which increases the longevity and durability of chip seal. It's nuanced work that takes a bit of time to complete, but leaves the road in much better shape. 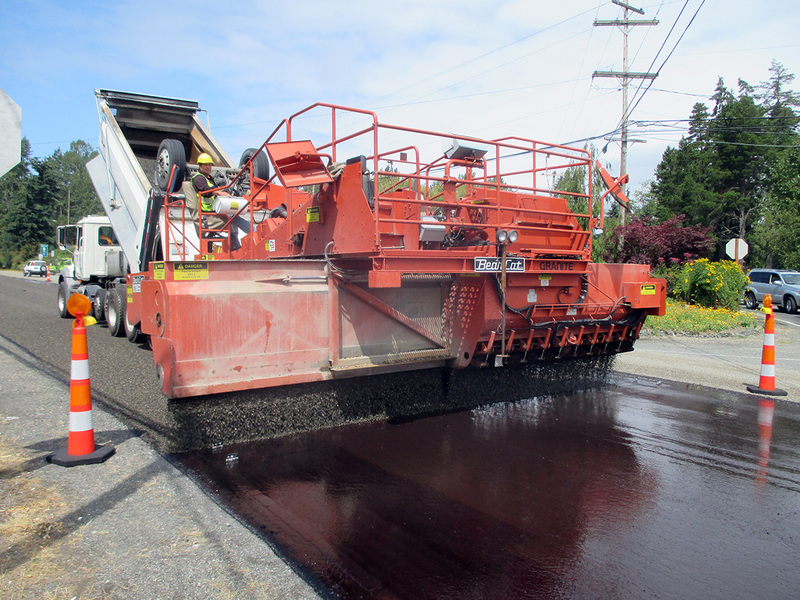 Depending on level of traffic, chip seal treatments typically last 6-8 years at 15-20 percent the cost of asphalt. So again, thanks for understanding. Oh, and the good news is the end is in sight. 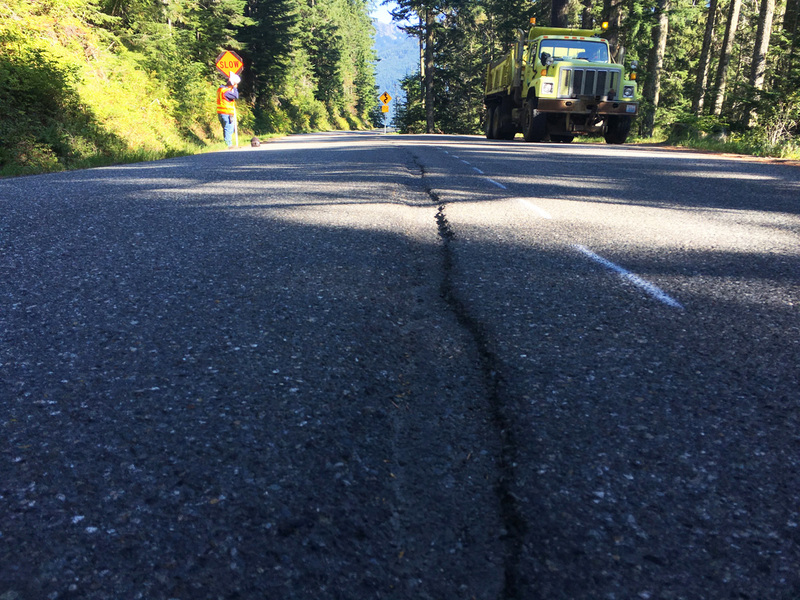 Crews should wrap up sometime before the end of September, and if all goes according to plan, you won't have to put up with this again for several years. Things look a little different across Snoqualmie Pass as all four lanes of traffic on the new avalanche bridge are open to traffic. This is all part of the major improvement project to widen a 15-mile stretch of I-90 from Hyak to Easton. This traffic shift is so we have enough room to start building the second avalanche bridge this summer. Once complete in 2018, the second bridge will accommodate westbound traffic, while the bridge we just finished will accommodate eastbound traffic. Over the next several weeks crews are going to be busy removing the old westbound lanes, blasting rock from the hillside and excavating the avalanche chutes so that snow and other debris this winter will go under the bridge, ultimately reducing the number of closures we have for avalanche control work. 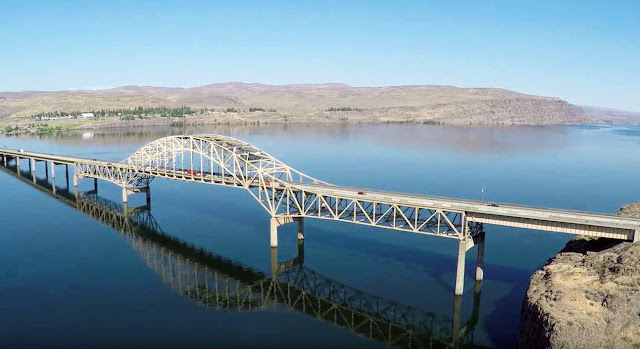 You will notice that the drive over the bridge is going to be a little tight, just like most areas across the pass due to construction and the need to shift traffic around the work zone. It’s going to be important to pay close attention to the road and obey the speed limit across the pass. After two years of hard work, we are excited to show you this major milestone. Join us live on our Facebook page Tuesday morning, Aug. 9 as we shift traffic onto the new avalanche bridge. In 2015 Washington was named the most bicycle friendly state in the nation, our eighth straight year of topping the list. In July it became an even better place to bike with the opening of the first portion of the bicycle/pedestrian path on the new SR 520 floating bridge. With this opening, the SR 520 Trail now extends from 108th Avenue NE in Bellevue to the west end of the new floating bridge, and the new section of trail has quickly become a favorite for cyclists, walkers and joggers – as well as the perfect viewpoint for watching the Blue Angels as they take to the sky for Seafair Weekend. West Approach Bridge North between the new floating bridge and Seattle. Dreams of becoming a bike warrior on your commute across Lake Washington aren’t yet a reality, however. We’re still building out the highway corridor, from east to west. 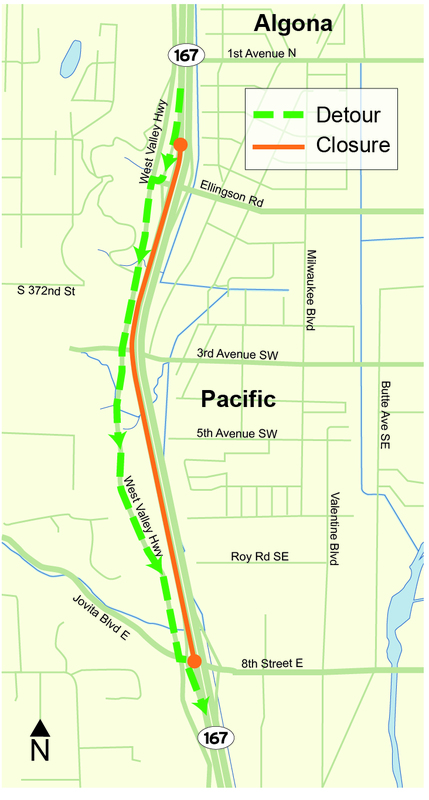 Due to phased state funding for the replacement of SR 520, the bike/pedestrian path opened on the new bridge is an out-and-back trail from Medina (pdf 2.9 mb). 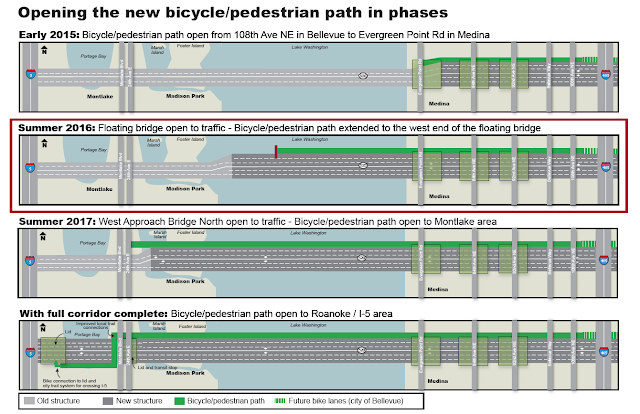 It will not connect the Eastside to Seattle until the West Approach Bridge North is complete in summer 2017, when the bicycle/pedestrian path will open between the west end of the floating bridge and Montlake Boulevard. Further down the road-- literally and figuratively-- the path will extend further west to I-5 (pdf 6.4 mb), with a bicycle and pedestrian crossing over I-5 to provide connections to Seattle neighborhoods, including Eastlake, South Lake Union, and downtown. Planning to check out the new path? Tweet your photos of your trip to @wsdot_520. We’ll retweet the best photos we receive. Happy trails to you! Until then, the 14-foot-wide path is still a big improvement for non-motorized travelers. The path is separated from traffic by sturdy barriers and a 10-foot shoulder on the adjacent roadway. 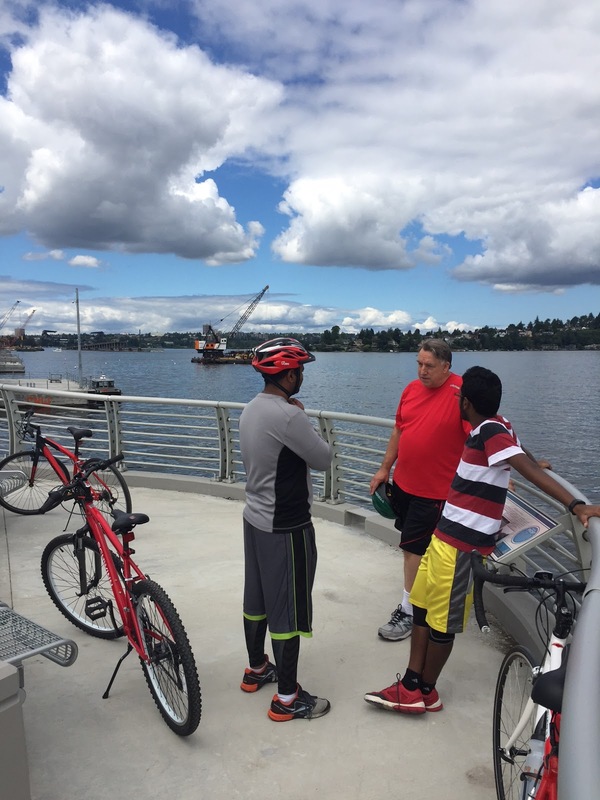 Additionally, the new path has belvederes, or rest stops/viewpoints, where people can take a break during the 1.3-mile-long ride across the bridge – and take in panoramic views of north Lake Washington.